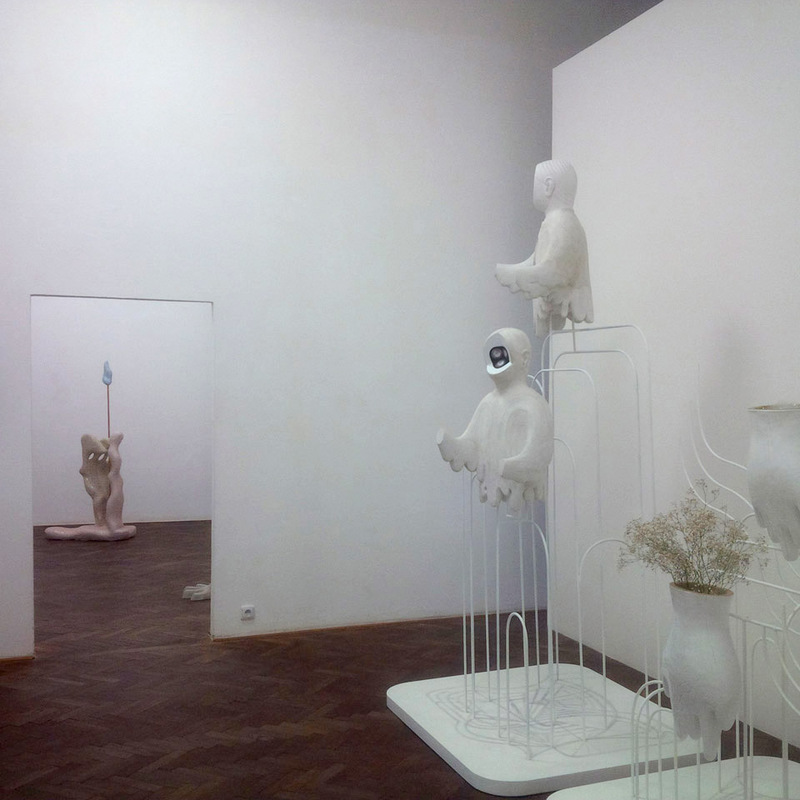 A duo-exhibition of two young sculptors. The exhibition space was located in an old crumbling palace, but the insides of the rooms were transformed in a white-cube setup, and I could feel that the exhibition architecture was considered as an inherent part of the overall experience for the visitor as she moved through the exhibition from the entrance towards the dead end and back again. The exhibition architecture helped to blend out the building architecture itself, and also helped to connect the two artist’s different styles together. Presented individually, each of the artist’s works on show could come across as a bit monotonous, especially Zsofie Keresztes’ work: iterations of the same material in slightly different forms. 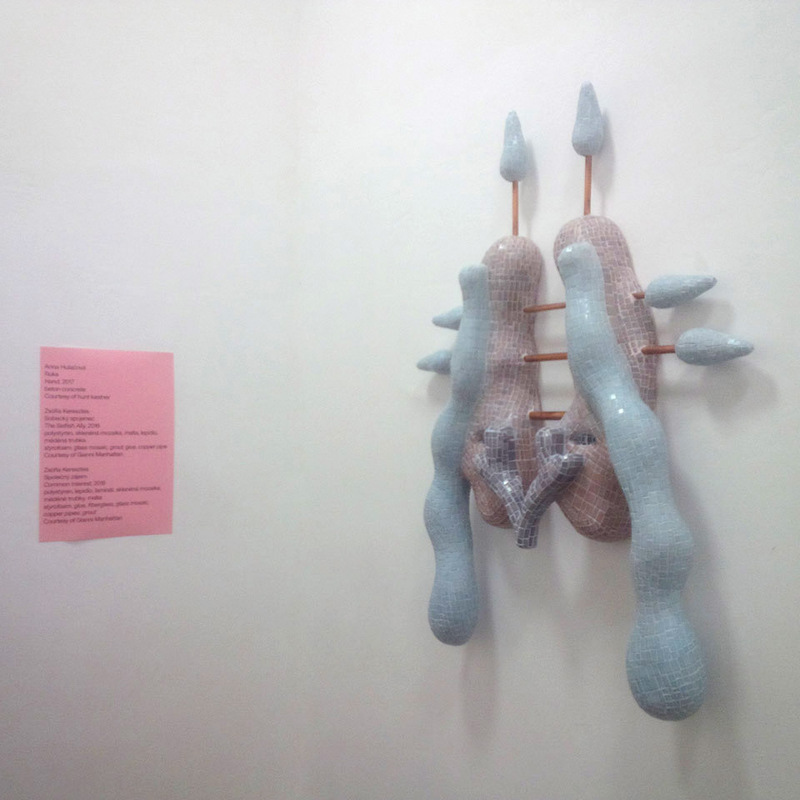 Anna Hulacova’s work showed more material variety, maybe because the works on show covered a slightly wider timespan. 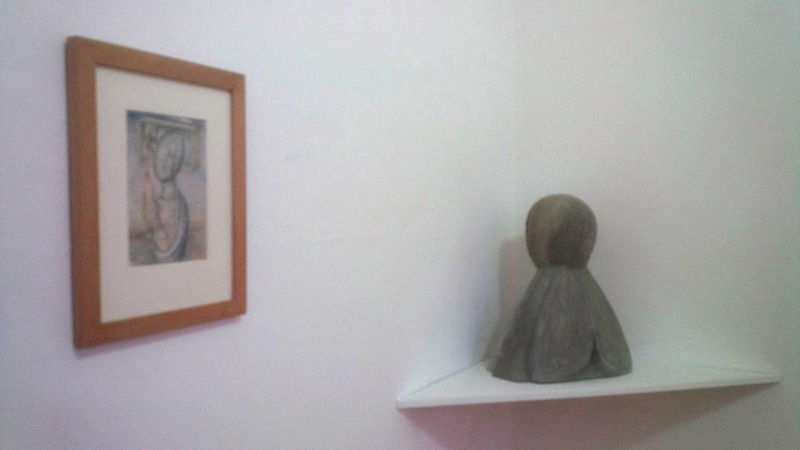 However, when placed together, the work of the two artists formed a unique body, making the visitor’s perception oscillate between the one and the other. 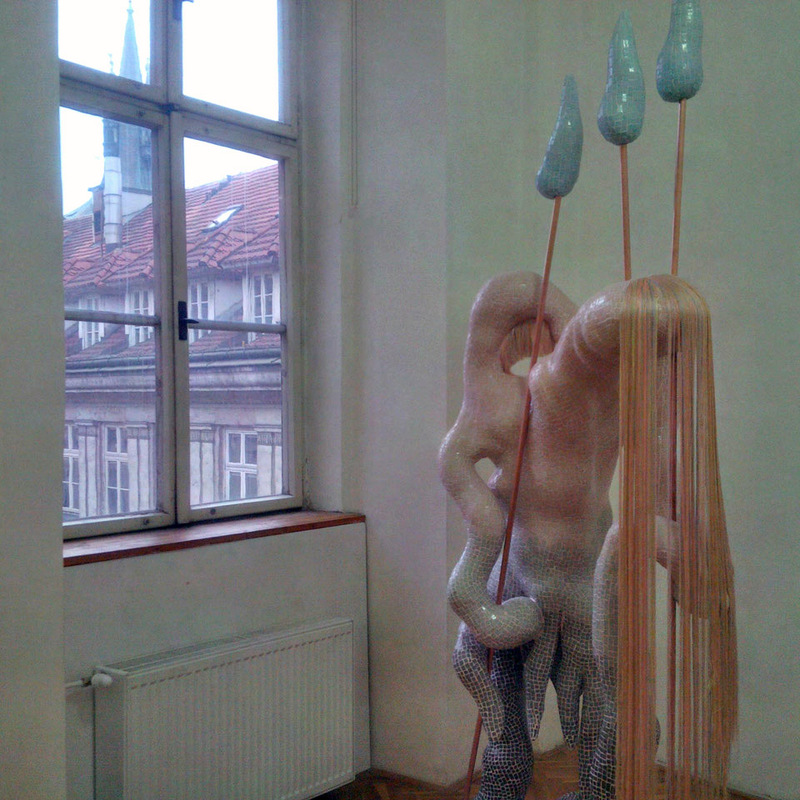 Keresztes’ sculptures had organic shapes that appeared as if they were melting. They were constructed from an unknown material on the inside, on the outside they were covered by small mosaic tiles that one is familiar with from bathroom or swimming pool surfaces. Also the colors were bathroom and swimming pool-like, blueish hues and pastel shades of related colors. 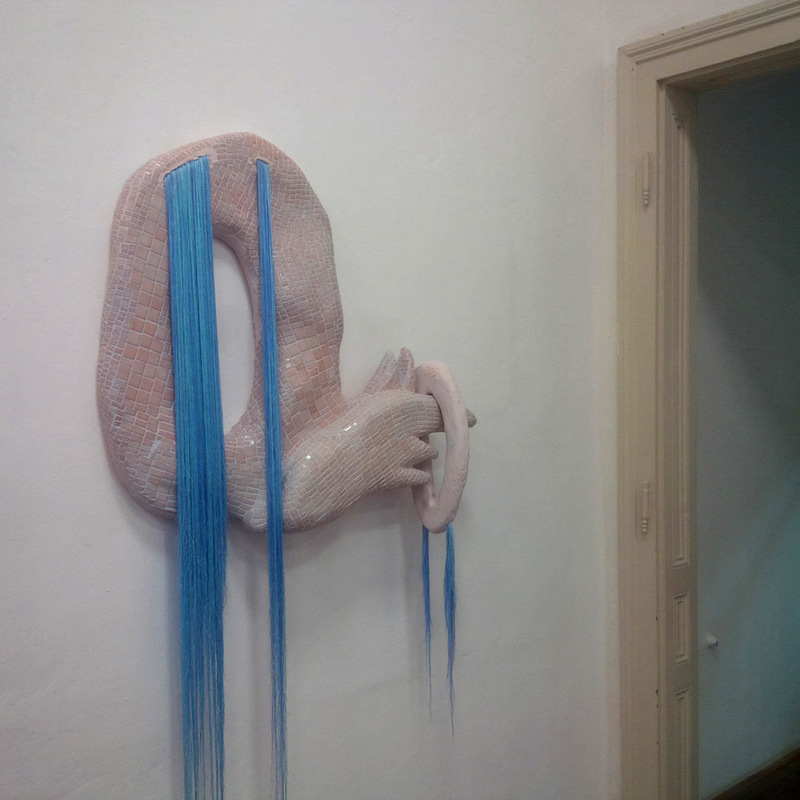 Occasionally, the bathroom tiles were interrupted by new shiny copper water pipes and artificial colorful hair. 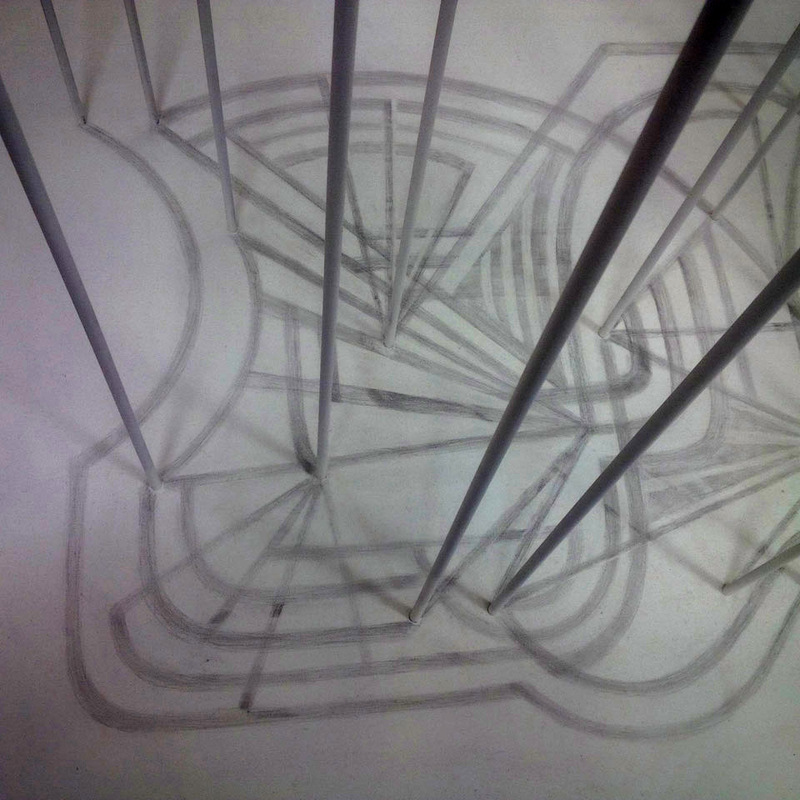 The fluid shapes definitely had some surrealist touch, like Dali’s melting clock. 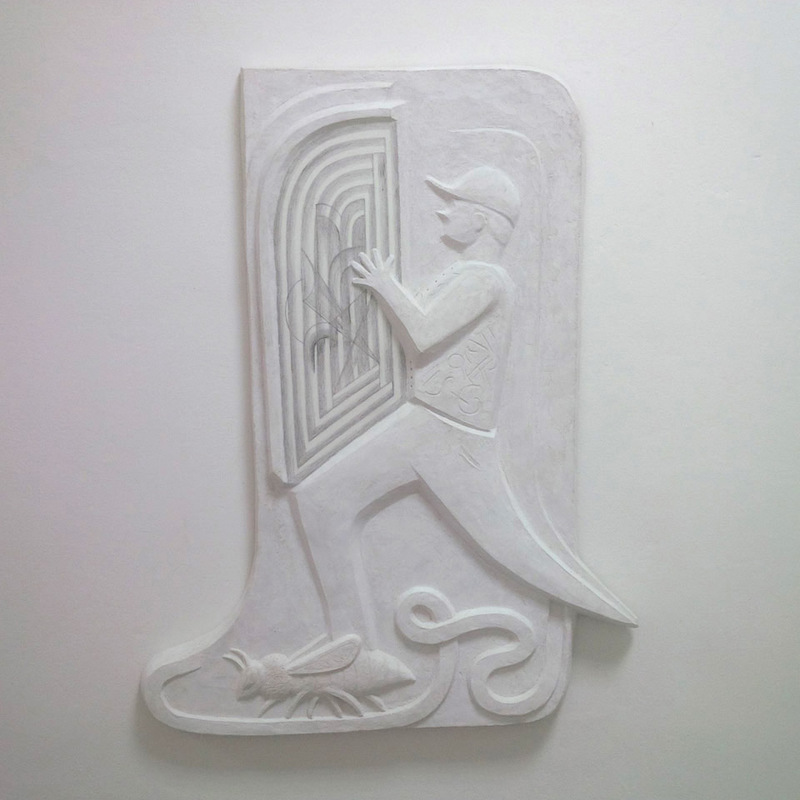 On the other hand the materials from the bathroom tile section of a construction material market gave the work a hand-crafty look, maybe in reference to East European DYI culture. Considering all the sculptures in the show, I have to note that they all looked slightly similar. This is on one hand important for building a young artist’s brand, but on the other hand, it made me aware of the moment in an artist career when artworks turn into tokens of an artist brand instead of standing for itself as independent artworks. Hulacova’s sculptures were both rougher and gentler. Rough, because the materials used (wood, concrete) were not obscured but exhibited as they were. Gentle, because the sculptures themselves in many cases contained detailed soft decorative elements (beeswax, pencil drawings). 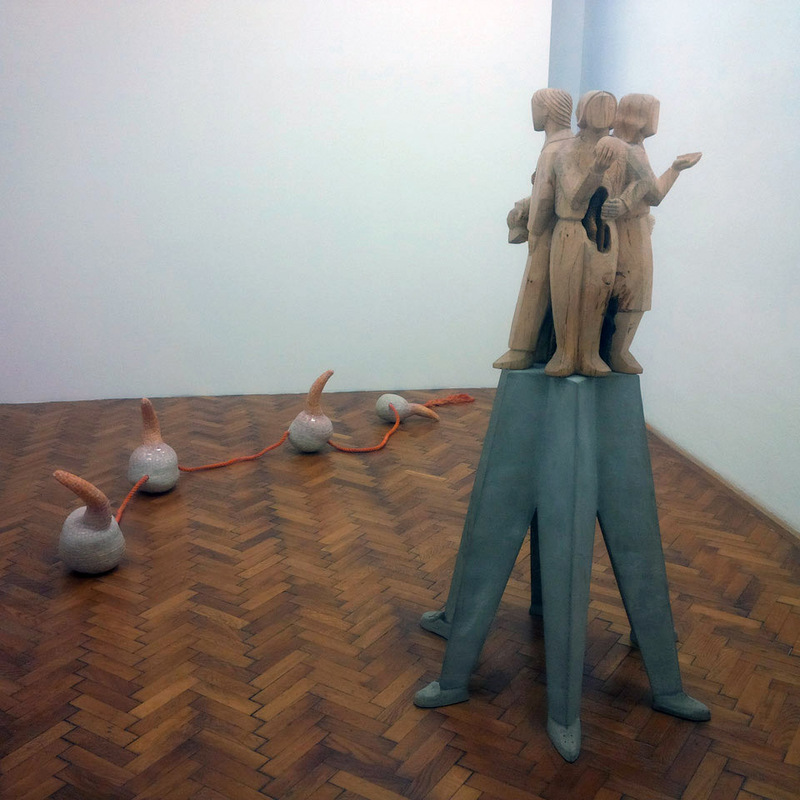 There were some figurative wooden sculptures in the show, e.g. a group of people standing with backs towards each other. This was slightly reminiscent of social realism. 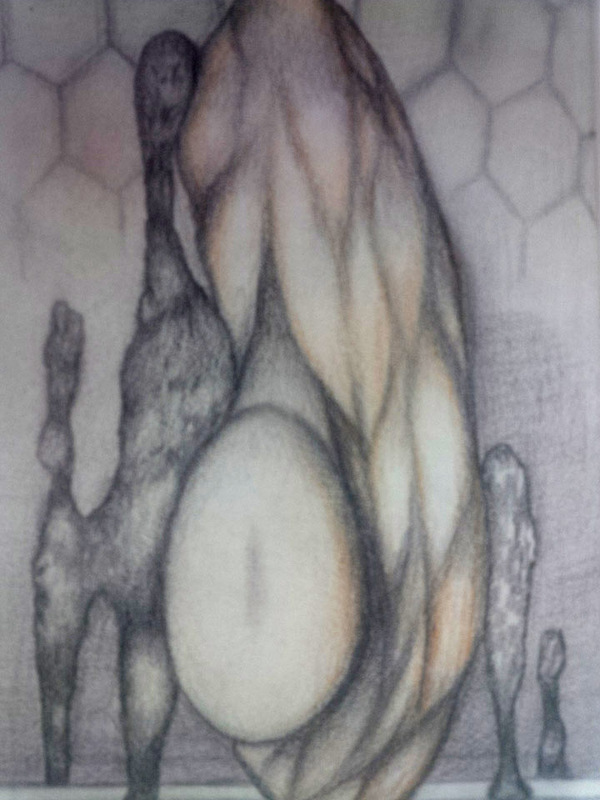 The bodies of the people were hollowed out, and inside were the wax cell remainders of a real beehive. 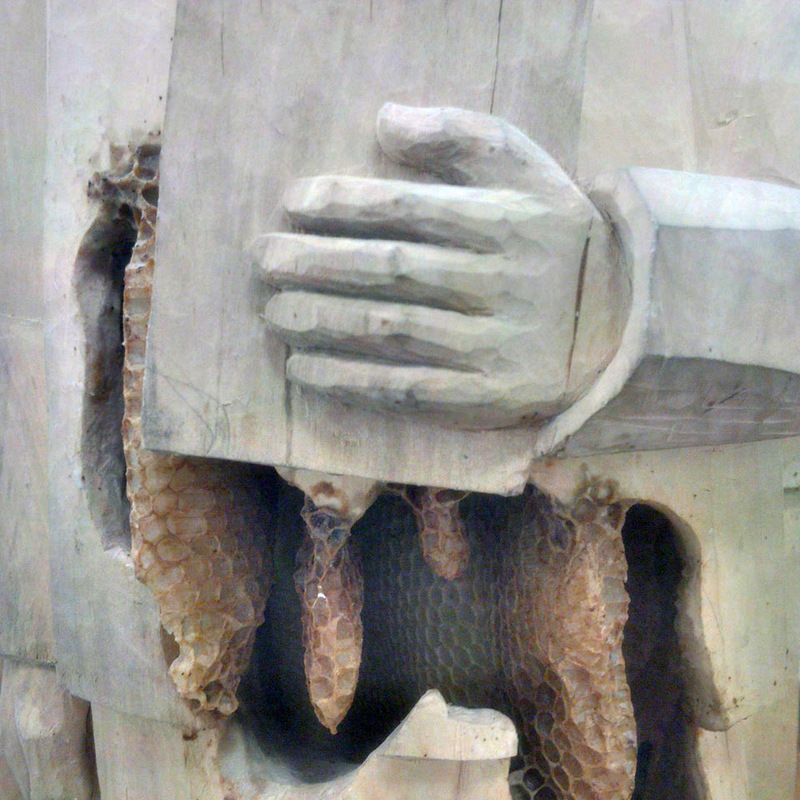 (I believe the artist really let the bees build a hive inside of the sculpture). This was, I believe, an older work. 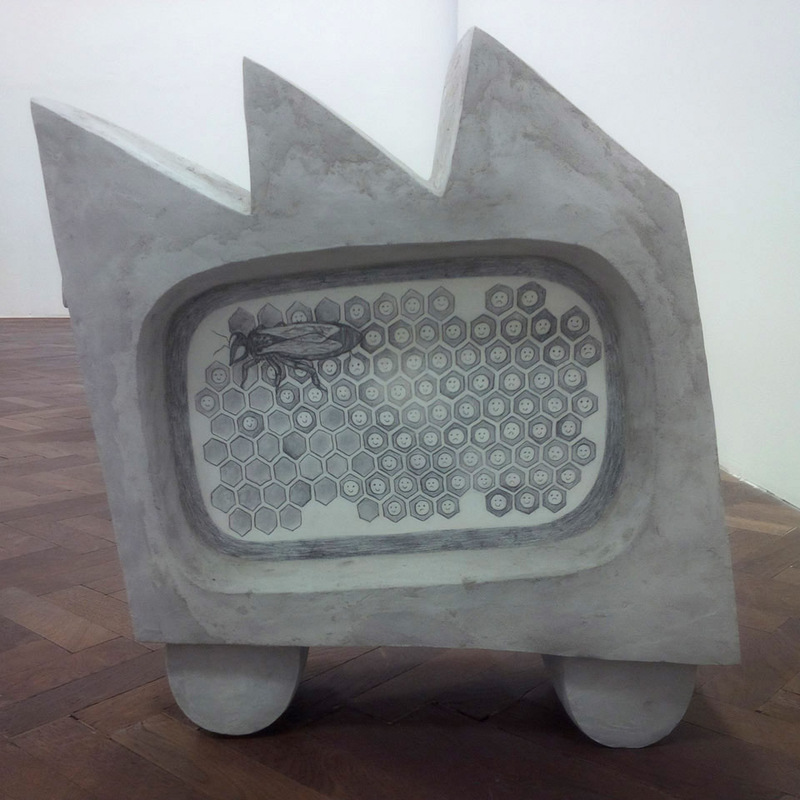 Newer works were made out of grey concrete, combined with wax or with slightly naïve pencil drawings on flat surfaces that looked like cross-sections. This variety of materials and media created an interesting thought space. There was something slightly surrealist about it too, but it was a much more ambiguous experience than in Keresztes work, because the rough figuration of the pieces did not fit in with that feeling. This ambiguity made the work intriguing to see repeatedly. On the invitation, the exhibition actually contained another artist’s name, Frantisek Janousek. He was a Czech surrealist active at the turn of the century. In the show he was represented by three small drawings in modest wooden frames located in the two last rooms of the show. 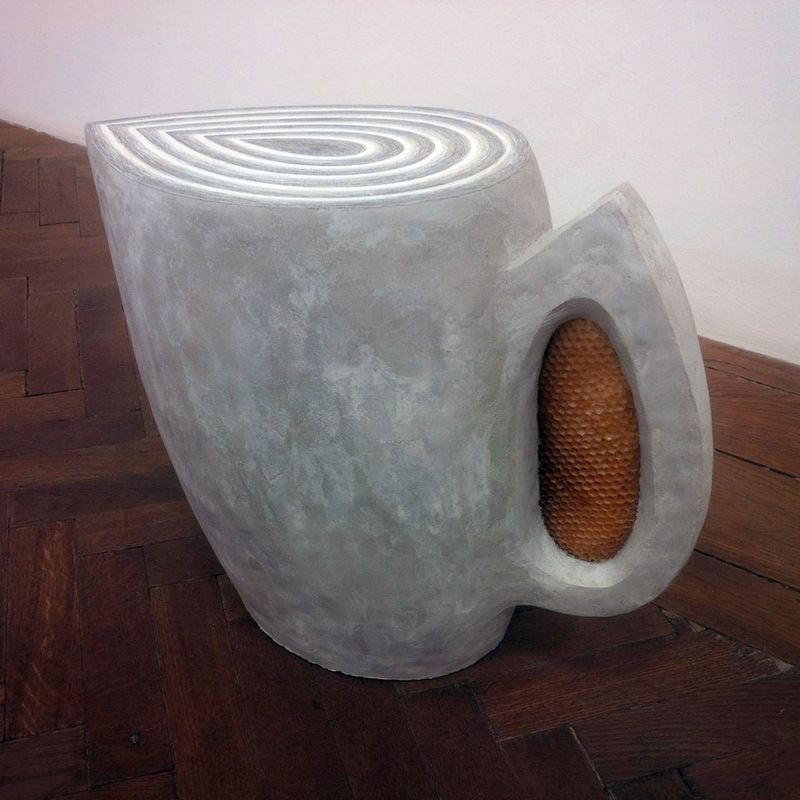 I intellectually understood why this artist was selected (surrealism, and the title of the work was From the Life of Bees). Placing him in the end of the exhibition route served as a kind of footnote. On site, I felt that more could have been done than hanging those little drawings from the gallery archive on the white-grey gallery walls. Nevertheless, the works did their job, of transmitting some of their historical aura onto the rising prominence of the two young sculptors. This show appeared to be carefully orchestrated – the spatial design, the combination of two artists, and the reference to surrealism. It was an exhibition that contextualized works. The curator, Sandra Baborovska, and the exhibition architect, Tomas Dzadon, should probably be credited for at least half the overall effect. I wonder about the effect of this contextualization for Hulacova and Keresztes. I could imagine that the origins of their work started from totally different contexts than that of surrealism. Hulacova definitely seemed to draw on folk culture and the East European socialist aesthetics. Keresztes’ work did relate to the surrealist architecture lineage with Gaudi as a reference, but maybe defining it like this is actually a constraint to the breadth of possible readings. The future creations of the two artists will tell.